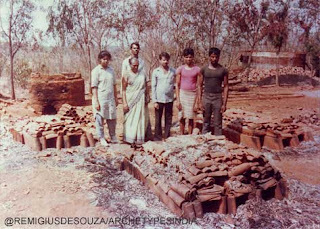 After I wrote “Clay country roofing tiles” in 1987, I suggested an NGO to conduct a demonstration-come-training programme for their housing project for the tribal in Raigad district. Their target group was Katakari and Thakar tribes. For this demo I brought two young men, Baliram and Deva, from village Amiyar in Bharuch district in Gujarat. They belong to Bhill tribe called “Vasava Koli”. I had already known them for quite some time. Vasavas are better educated than many tribes. Vasavas practice their skills of clay tile making at household level. Their technique resembles to one that I had seen, during my childhood, with the potters at my native village in Konkan Region, decades ago. The illustration 1 shows the hamlet “Navi Fali” – a part of village Amiyar, where Baliram and Deva live. 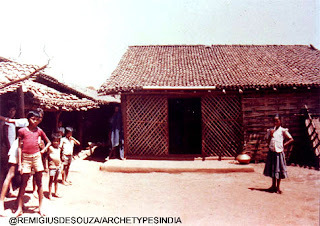 It is evident enough that the houses are built of organic, locally available materials – clay, bamboo and wood. The settlement is built by self-help and community participation. Illustration 2 shows the cattle sheds, which are suitably built for the purpose. Baliram and Deva received good facilities of accommodation, food at the mess, travel and to work at the NGO’s campus in a village. They scouted the surrounding area with the staff of the NGO, found suitable soil, which was transported to the work shed at the campus. They produced about three thousand tiles within three weeks. 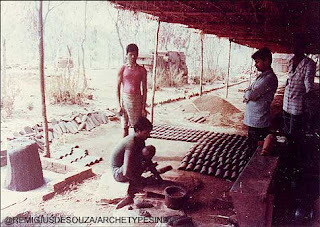 Illustration 4 shows the demonstration work in the shed provided for the prepared soil, tile making and drying the raw tiles. Illustration 4 shows the burnt clay tiles. Persons in the picture (from left to right) are a visitor, a lady office bearer, two staff member (one in the rear), Deva and Baliram. 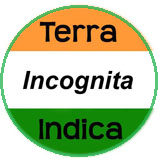 1. during the demo the NGO did not invite or bring the adivasis – Katakari and Thakar – either to watch it or for the training. 2. The staff (social workers) occasionally visited the demo. None of them tried their hand at making the tiles. Knowing the urban ways, Baliram and Deva as well s myself were indifferent about it. 3. I don’t know if the NGO did ever document the whole operation – labour, logistics, and utility – price-value-cost-benefit – of the product, perhaps other than voucher for accounts purpose. Needless to say, NGO used substandard (i.e. cheaper) Mangalore tiles for the housing. 4. NGOs, either in Gujarat or Maharashtra, are not interested in the tribal skills, knowledge, their self-reliance, and above all their self-respect. One can safely generalise this statement. Forget about NGOs. But I m really feeling proud about people like you. This kind of roofing is rare now. Your comments are among thebest gifts at the end of the year, not that pages of calender makes any difference. My focus is more on people and their resources in every possible aspects of self-reliance, in the present market oriented culture of the urbanite. Hi Remi, I'm too happy. Thanks for writing on architecture,ecology and the local methods of construction. Also it feels really nice to know that you have are worked with people on local methods of construction. I myself an architect is deeply interested in sustainable(!) practices.I've worked with different local methods of construction i.e. wattle and daub,cob,stone. Really interested to know more about your practice and thoughts on ecology-energy and architecture. Please keep writing. Its inspiring for students like me. Thanks and Regards!! And just updated and republished one, "South Asia Jazz" on this blog. People are slowly changing towards environment-ecology-energy issues throughout the world, but still are bound by compartments. That too will change slowly. I wish you very best in your efforts. Remember, our working (with hands and mind) is the sound base and beginning of learning and leisure both, helps health of body and mind. 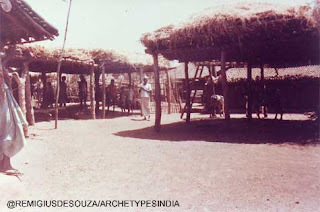 Please also do visit Archetypes India URL http://remidesouza.blogspot.com when time permits.